So I walked out of our office today after a pretty tough set of discussions (well, one was great with one of the big search marketing networks) and there in the middle of the parking lot was...inspiration. 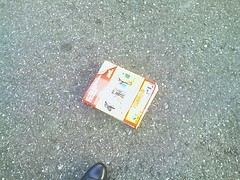 Another abandoned Yellow Pages sitting there all alone in the parking lot in Los Altos. I quickly took a picture with my camera phone and shared it with my team. This of course reminded me of how much like the Yellow Page companies of today, Kodak and others kept telling everyone; "we are not going anywhere, we have been around for ever and we are better". Well today there are 10 times as many pictures taken with Mobile Phones than are taken with camera's. The Yellow Pages industry is structurally unsound. It will collapse. On another note, we just pushed several new features and improvements to our site. Take a look at the new feature set in case you've missed it. A picture is worth 1,000 words and we've incorporated a great new way to showcase your business. Pictures of yourself, location, employees, offerings, and most of all your happy customers are now easily viewable on your merchant profile for all to see. And, that's not all! The latest pictures are also showcased on neighborhood pages for the community to marvel. So upload upload upload and get your business noticed with this great new feature. Have an offer you want the community to see? Well, we just completed development of MerchantCircle's virtual bulletin board for communities: Just like the bulletin boards you see at family centers, restaurants, and libraries; you can post whatever you like. Have something to sell? Post it! Have a job offer you want listed? Post it! Want to advertise your business in other communities? Post it! We all know measuring leads is key to proper advertising and so we've included a brand new email report sent directly to you. This monthly activity report will inform you on the latest happenings of your MerchantCircle listing; everything from your profile traffic, to consumer ratings, and reviews all rolled up into one valuable report. Along with this vital information we include tips and suggestions to attract even more customers to your doorstep. So be on the look out for your monthly activity . I think I tripped over some yellow pages this morning....Seriously, I am really excited about the emailed reports. I'm curious about how detailed they will wind up being and how much info they will provide. Can't wait to get my first one!